CLICK HERE FOR AN UPDATED BEGINNER’S GUIDE TO NJPW FOR 2019! Everyone has been talking about it. You’ve seen the internet blow-up over their five and six star matches, you’ve seen everyone wearing Bullet Club and Los Ingobernables de Japon t-shirts, and you’ve even heard WWE commentators talk about the likes of AJ Styles, Shinsuke Nakamura, and Gallows and Anderson being IWGP champions – so why haven’t you started watching New Japan Pro Wrestling? Is it because it’s on the other side of the globe? Maybe it’s not the style of wrestling you’re used to? Perhaps you’re worried you won’t recognise any of their stars? Or is it because you just have no idea where to start? Well, here’s where I come in to help. I know how daunting it can be delving into an entire new world of wrestling, and you might need a little bit of guidance through this strange Eastern promotion. In this guide, I have provided ten matches for New Japan newbies to help get you into watching some of the best grappling on the planet. I’ve made my selections based not only on in-ring quality, but also on how accessible they are to new fans – each match features something that will be familiar to you, whether that be familiar faces that have had significant success in the west, English commentary to help you along the way, or that it’s easy to access online without setting up a paid subscription. I’ll also explain some of the traditions, unique quirks, and oddities that come along with this fantastic promotion. But that’s enough talk, let’s get down to some wrestling: here are 10 Matches for NJPW Newbies. This isn’t just a match I would recommend to New Japan newbies, it’s a match that I believe every single wrestling fan in the world needs to see. This 45-minute masterpiece had something for every type of wrestling fan – technical wizardry, world-class storytelling, stiff, hard-hitting strikes, one of the most ridiculous table spots in history, and more false finishes than you can count. It’s a true work of art that you won’t be able to take your eyes off. You’ll be fully sucked into the tension and the drama until you’re hanging off the edge of your seat. Every time you think, “This has got to be it”, the match continues to go on, leaving you gasp with surprise and excitement. Omega hit Okada with almost every move in his arsenal, including a devastating Super Dragon Suplex, but he could not connect with his most dangerous weapon – The One Winged Angel. After a ridiculous amount of Rainmakers, the 6-star epic was finally over, and the wrestling world exploded. While many believe that their second encounter at NJPW Dominion is the superior match, I feel as though this masterpiece is much more accessible to new fans, and if you are interested in indulging in a little New Japan Pro Wrestling, then this is the perfect place to start. ALSO RECOMMENDED – Kenny Omega vs. Michael Elgin in the First Ever Ladder Match in Company History: NJPW Dominion 2016 (One of the best one-on-one ladder matches I’ve ever seen that is very accessible for non-NJPW fans, and also available with English commentary). Before they both left to become Smackdown Live superstars, Shinsuke Nakamura and AJ Styles were main-eventers in NJPW. Although we are all still waiting for them to clash in WWE, they already have faced off against each other once before, and it marked the final singles match in New Japan for both of these former world champs. This match is simply a masterclass in every aspect of wrestling – the way both men are able to trade holds and reversals effortlessly at such a fast pace is incredible. Shinsuke’s undeniable charisma, catching AJ’s imaginary bullet and proceeding to eat it, the stiff strikes, and the beautiful back-and-forth throughout, all of it is wonderful. Both AJ and Shinsuke became megastars in Japan, so once they finally made it onto Vince McMahon’s payroll, they were immediately pushed up the card, and if you’ve experienced how amazing both of these men are in this match, you’ll understand why. If there is one reason to watch NJPW, it’s because they have The Young Bucks. Arguably the world’s great tag team, the Jackson brothers are unbelievably fluid and entertaining inside and outside of the ring, and they’re always a delight to watch, as is the rest of the junior tag team division, which is on full display here. In New Japan, there is a very clear divide between heavyweight and junior-heavyweight (cruiserweight) competitors, so much so that they even have separate tag titles for each division, yet regardless of the weight class, you’re guaranteed to get some great tag team action, and this match is proof of that. Yes, that’s right, Brock Lesnar spent some time in Japan between his two runs in WWE, and he was pretty damn successful. Winning the IWGP Heavyweight Championship in his very first match, Lesnar had one of the most dominant gaijin (non-Japanese wrestler) runs in company history. And one of his title defenses came against another former and current WWE employee – Giant Bernard, A.K.A Prince Albert, A-Train, Tensai, Sweet T, Matt Bloom, etc. I’ve included this match because it shows that NJPW isn’t just a place for Japanese talents to thrive, as well as the occasional Westerner that has yet to have a run in WWE – from time to time, they bring in huge, established stars into their ranks and take full advantage of their world-wide recognition. Familiar faces currently performing in the company include Cody Rhodes, Davey Boy Smith Jr, and even former DX member, Billy Gunn. 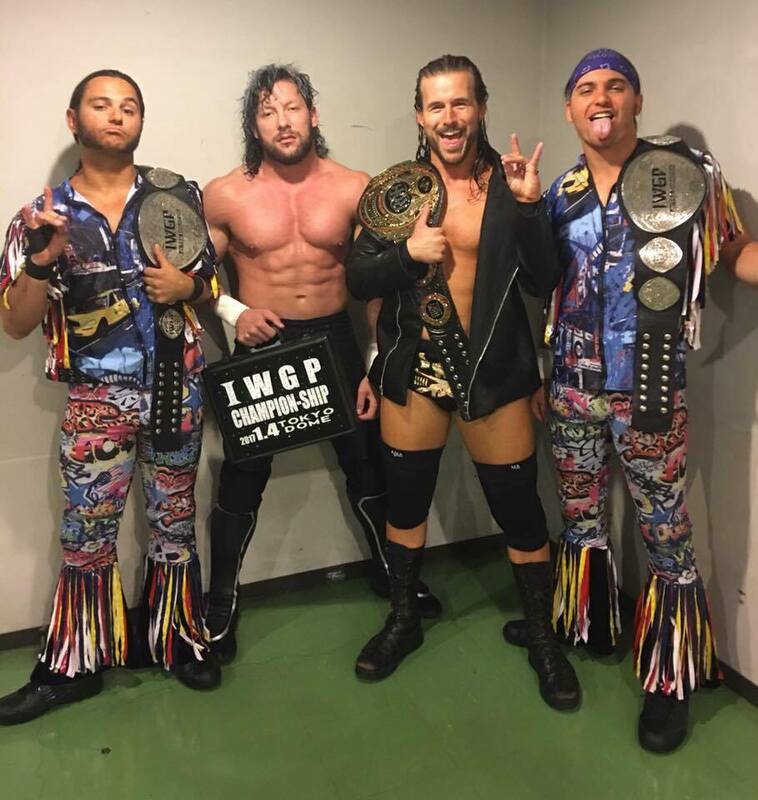 Let this match show that just because NJPW may be a completely new world to you, it doesn’t mean you won’t recognise a few stars from time to time. After watching a few New Japan shows, it will become blatantly obvious that their cards feature a LOT of 6-man and 8-man tag team matches, with the intent of giving legendary talents like Jushin Thunder Liger and Tiger Mask an easier time in the ring, allowing the young lions (NJPW’s rookies) a chance to learn from veterans, and in order to build to future singles matches participants on opposing teams. Whilst most of these multi-man matches aren’t anything special, if you want a great, accessible example of one of these NJPW staples, look no further than the match between Bullet Club and Chaos, two of the company’s biggest factions, from Power Struggle 2016. It features two of the best wrestlers in the world today, Omega and Okada, along with incredible high-fliers Will Ospreay and The Young Bucks. These tag team showdowns won’t exactly blow you away, but they’ll keep you entertained until the main events, which are usually some of the best matches in the world. Prepare yourself, it’s time to …dive into the junior-heavyweight division. Three of the best junior-heavyweight wrestlers of the 21st century clashed back at Wrestle Kingdom 7, and it made for magic results. All three of these men have competed in WWE in the last ten years, so you’re guaranteed to recognise at least one of them – Kota Ibushi competed in the incredible Cruiserweight Classic tournament, Low Ki won the second season of NXT as Kaval (and also competed extensively in ROH and TNA), and of course, Prince Devitt is now former Universal Champion, Finn Balor. In an extremely rare triple threat match in New Japan, these three junior-heavyweights showed exactly why they’re some of the best in the world at what they do, and it will give you the perfect taste of what this division is all about. And speaking of Kota Ibushi, just two years later, Ibushi was in the heavyweight division fighting against former world champion, Shinsuke Nakamura, for the IWGP Intercontinental Championship. Even though there is a clear divide between the heavyweight and junior-heavyweight divisions, it’s not uncommon for wrestlers to transition between the two. Stars like Kenny Omega and Tetsuya Naito made their starts as junior-heavyweights, before gaining more weight and more success as heavyweights at the top of the card. In this 2015 bout, the two men push themselves to the limit in an incredible, five-star match that every wrestling fan needs to witness. If there’s one thing Japanese wrestling is known for, it’s for how seriously it’s taken. Even in 2017, kayfabe is alive and well over in Japan – it is treated on the same level of respect as MMA, action tends to be extremely hard-hitting and stiff, and getting into the business is a brutally tough process. However, as serious as this wonderful sport may be, there’s something else the Japanese are known for – being absolutely ridiculous. In the midst of trained martial artists and some of the best performers in the world, NJPW loves to sprinkle in a little comedy wrestling on a regular basis, usually at the hands of Toru Yano. Yano specialises in the art of comedic wrestling, and basically never has a serious match. But the thing about these ridiculous bouts is that they’re not reserved to a select few performers or to lower-card talents, they can involve anyone in the company. Toru Yano regularly faces off against some of the best and most popular wrestlers in Japan, and every single time, he forces them to wrestle his style of match, regardless of the position they have in the company. It’s quite strange watching a chubby Japanese man throwing a DVD case full of flour into Kenny Omega’s face, or winning a match by count-out after tying his opponent’s legs together, but it’s a welcome change of pace that offers a different form of entertainment than we’re used to. It may take a few tries to finally get your head around what’s going on, but I’m sure eventually these matches will have you cracking a smile or two. Every summer, New Japan treats wrestling fans with the Match of the Year machine that is the G1 Climax tournament. Over the course of four weeks each year, a selection of NJPW stars compete in a round-robin tournament with an IWGP Heavyweight Championship match up for grabs for the winner. The competitors are separated into two blocks – every wrestler in their respective block faces each other at some point during the tournament, competing for points rather than elimination. The competitor with the most points in each block then clashes in the final to determine the overall winner. The beauty of the G1 Climax tournament is the mix of matches and iconic clashes we get to witness – up-and-coming stars face-off against bonafide legends and current champions (even the world champ is involved), tag teams are pitted against each other, surprise victories happen on an almost nightly basis, and at any point of the tournament, you could easily see a MOTY candidate. One of the most iconic matches in G1 history was the clash of two of the company’s biggest stars of all time back in 2015 – Shinsuke Nakamura vs. Hiroshi Tanahashi. Now, at first this may seem a bit different to the WWE matches you’re probably used to seeing Nakamura involved in, and the fifty-minute run time could be a little off-putting at first, but I implore you to give this one a chance as it is pure magic. In this five-star epic, Tanahashi and Nakamura bring the big fight feel throughout, starting slow, and building throughout until they unleash every weapon in their arsenal in an exhilarating final 10 minutes. It really is an example of two of the best in the world at their very pique, and since New Japan recently released the entire match for free on their YouTube channel with English commentary, you have no excuse not to watch it. ALSO RECOMMENDED – Kazuchika Okada vs. Tomohiro Ishii: G1 Climax 2016 (This match didn’t take place in the finals or even semi-finals of the tournament, it was just a match that could have taken place on any given night during the G1, and shows just how incredible one of those fights can be). Speaking of the G1, the 2016 edition of the tournament saw some absolutely fantastic matches, and this semi-final clash was arguably the best of them all. Both stars were oozing charisma throughout, displaying their villainous characters at all times, by posing and even spitting at each other. But don’t let their showmanship fool you, their brutally hard-hitting ways were fully on display, trading stiff shots and environmental attacks all throughout the match. Possibly the most memorable highlight of the match (other than Naito’s all-white suit) was when Omega powerbombed Naito over the barricades and onto an announce table with authority, and then hit one of the most insane springboard moves of the year. The height and distance Omega can achieve with his dives is truly a sight to behold. This match must be seen to witness how high and how far The Cleaner manages to soar through the air during this breath-taking sequence of moves. After a hard-fought war from both men, Omega managed to come out on top after a beautiful One-Winged Angel, and would go on to win the whole tournament, which would in turn lead to Omega’s unbelievable matches against Kazuchika Okada mentioned at the beginning of the article, and solidified him as one of the greatest in the world today. If you’re yet to treat yourself to a New Japan match featuring either the leader of Bullet Club or the head of Los Ingobernables de Japon, then look no further than this. And that’s my guide. If you enjoy wrestling in any way, then I beg you to try and watch at least one of these matches, because when it comes to consistent match quality, nobody can beat New Japan right now. It may not end up being your cup of tea, and that’s totally fine, we’re all different, but don’t deny yourself the chance of a great, new experience.